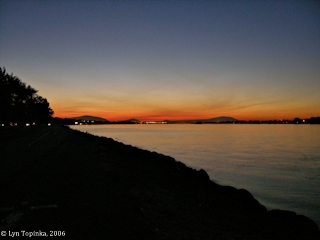 "Richland, Pasco, and Kennewick, Washington"
Click image to enlarge Columbia River from Columbia Park, Richland, Washington. View along Columbia Drive. Image taken September 29, 2003. Three Washington cities, Richland, Kennewick, and Pasco, are located along the Columbia River and make up the "Tri-Cities" of Washington State. These cities stretch from above the Yakima River downstream to the Snake River. 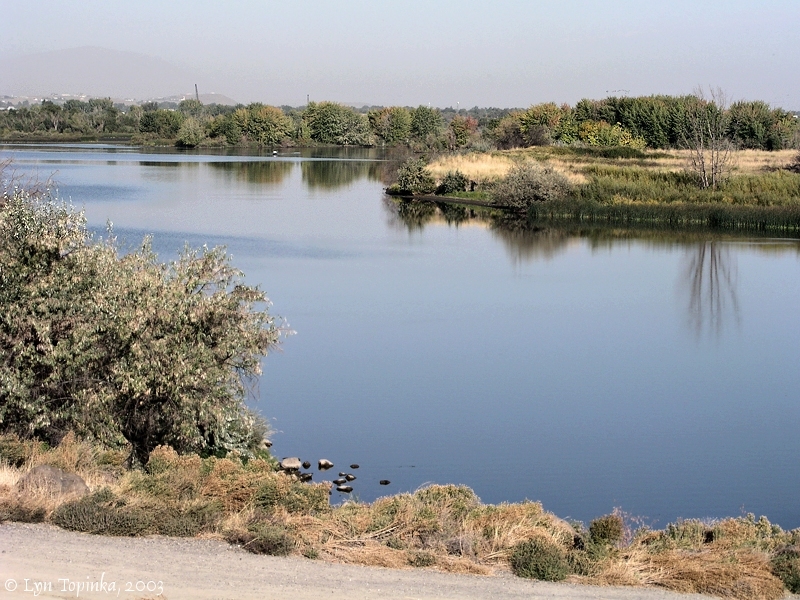 Richland is located furthest upstream while downstream are Kennewick on the south bank and Pasco on the north bank. Lewis and Clark spent two nights at the mouth of the Snake River at today's Sacajawea State Park. On September 17, 1805, Captain Clark journeyed up the Columbia as far as Bateman Island at the mouth of the Yakima River, passing today's locations of Columbia Park, Clover Island, and the "Blue Bridge" and Cable Bridge, which today connect the two cities of Kennewick and Pasco. The city of Richland is the furthest west of the Tri-Cities. It was originally known as Chemna by Chemnapum Indians who lived at the mouth of the Yakima River (which they called "Tapteal"). The first white settlement in the Richland area appeared in 1863, and by 1880 a stage coach company was established. In 1892 Nelson Rich and Howard Amon formed the Benton Water Company which brought irrigation to the area. The first post office opened in October 1905, listing the town as "Benton". A contest was held to decide the official name for the town and Richland was the winning name. (According to Robert Hitchman in Place Names of Washington (Washington Historical Society, 1985) the place was named "Richland" in 1904 after landowner Nelson Rich.) The city of Richland was officially incorporated in 1910, with a population 240. Richland remained a small farming community until the population boomed in 1943 when the U.S. Government assumed ownership of the area and built the country's first nuclear reactor on the Hanford Site. The Manhattan District of the U.S. Army Corps of Engineers acquired the towns of Richland, Hanford, and White Bluffs, and designated the area as the Hanford Atomic Works. They began the development of the atomic bomb. In 1944, the first reactor began operation at the Hanford Project. Camp Hanford’s population peaked at 51,000, and spanned not quite two years until its abandonment in February 1945. E.I. du Pont de Nemours and company governed the city until General Electric Company, acting as administrator for the Atomic Energy Commission (later the Energy Research and Development Administration and subsequently the Department of Energy), assumed control in 1946. 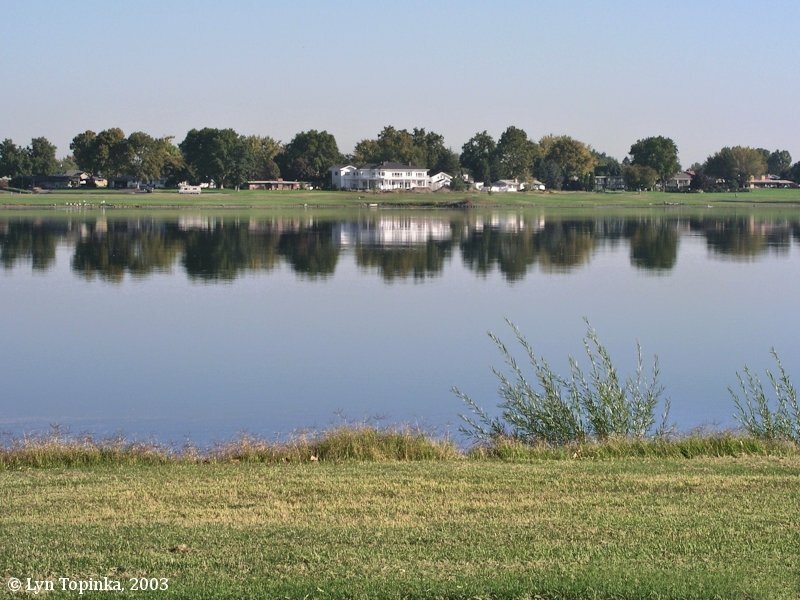 In 1948, the City of Richland was officially dissolved, and was reincorporated in 1958. The last production reactor closed in 1988. Today Hanford remains a research center, and the Hanford Reach remains the last free-flowing stretch of the Columbia River in the United States. Hanford was designated as a National Monument during the Clinton administration. 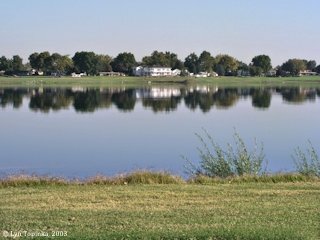 Kennewick, Washington, is on the south bank of the Columbia River, directly across from Pasco, at approximately Columbia River Mile (RM) 329. The location was a popular winter fishing grounds for the native tribes. The first white settlement was near the mouth of the Yakima River in 1863. Twenty years later the Northern Pacific Railroad decided to continue their transcontinental track across the river in the area. To this end the towns of Pasco and Kennewick were created. A ferry existed to transport the trains across the Columbia until 1888 when the railroad bridge was completed. According to Robert Hitchman in Place Names of Washington (Washington Historical Society, 1985) the original name for the town was "Dell Haven", which was later replaced with the Indian name "Kennewick". The name "Kennewick" has been translated to mean "grassy place", "winter paradise", "winter heaven", and even "dried acorns". By 1892, Nelson Rich and Howard Amon formed the Benton Land and Water Co. bringing irrigation to the area for the first time. Kennewick became an incorporated city in 1904. Thousands of people moved into the town with the advent of World War II, the Hanford Atomic Project in nearby Richland, the construction of McNary Dam, and the Columbia Basin Irrigation Project. Pasco, Washington, is located at the confluence of the Columbia River and the Snake River, at approximately Columbia River Mile (RM) 329, and includes Sacajawea State Park, the location of Lewis and Clark's campsite in October 1805. Pasco lies on the northern bank of the Columbia River while Kennewick lies on the southern bank. According to Robert Hitchman in Place Names of Washington (Washington Historical Society, 1985) Pasco was a railroad town established in 1884 by the Northern Pacific Railway Company. It received it's name from Henry M. McCartney, a location engineer for the Northern Pacific. McCartney named the town after a Peruvian mining town called "Cerro de Pasco". McCartney had recently surveyed the Oroya Railway in Peru, and found Cerro de Pasco the highest and coldest place he had ever been. Upon arriving in eastern Washington, McCartney was greeted by a sandstorm and heat. He named the new Washington town for the contrast. Pasco was incorporated in 1891. 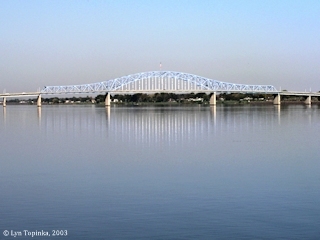 Click image to enlarge Pasco-Kennewick "Blue Bridge". 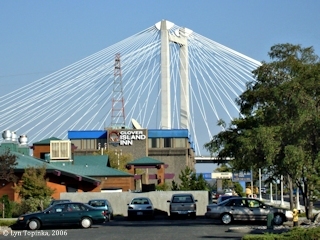 Kennewick's "Blue Bridge" as seen from Clover Island. Image taken September 29, 2003. Click image to enlarge Sunset on the "Cable Bridge", Kennewick, Washington. Image taken September 24, 2005. 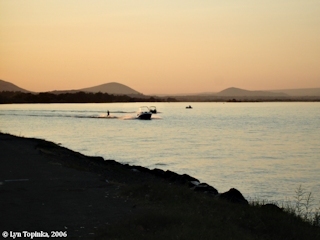 Click image to enlarge Sunset, Columbia River looking upstream, as seen from Kennewick, Washington. Image taken September 30, 2006. Click image to enlarge Richland sunset as seen from Columbia Park, Washington. Image taken September 29, 2006. 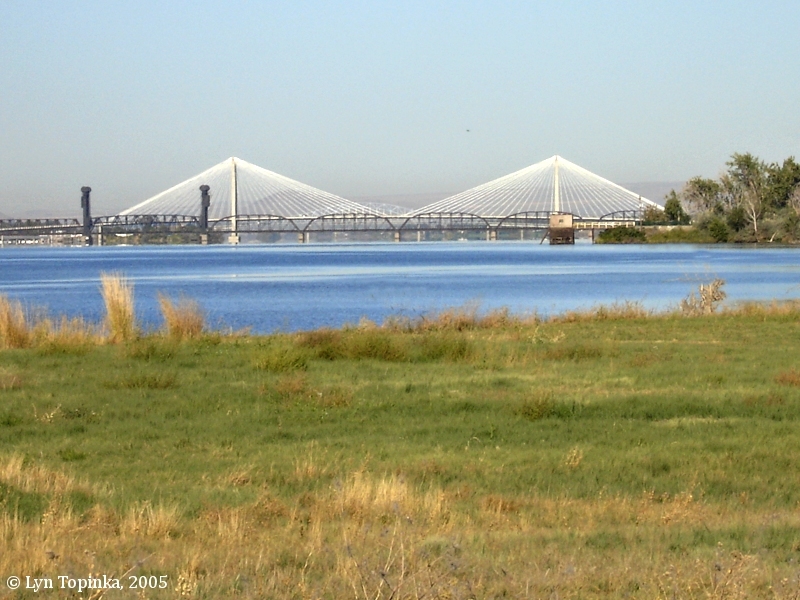 Click image to enlarge Kennewick and the Cable Bridge, as seen from Sacajawea State Park. Also visible is the old railroad bridge which was originally built in 1888. Image taken September 29, 2003. Bateman Island is located on the Columbia River at River Mile (RM) 333, between the cities of Richland and Kennewick, Washington. 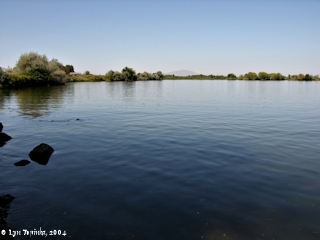 The island is located just downstream of the mouth of the Yakima River "estuary". Bateman Island is the farthest Captain Clark journeyed up the Columbia on October 17, 1805. Click image to enlarge Bateman Island, view of upstream end. Bateman Island is the farthest point upstream on the Columbia River Lewis and Clark ventured. The mouth of the Yakima River is just out of view on the left. Image taken from Island View, Washington, September 29, 2003. 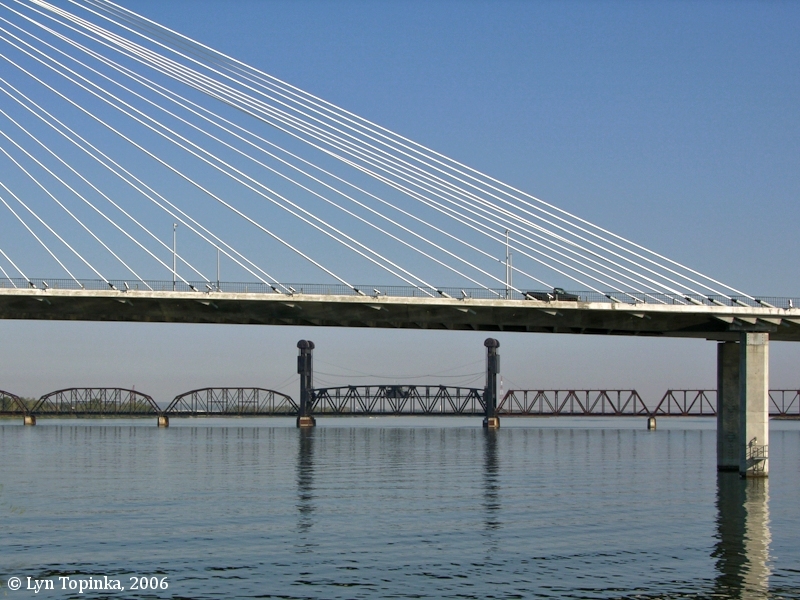 The Pasco-Kennewick Bridge ("Blue Bridge") is located at Columbia River Mile (RM) 330, approximately 3 miles downstream of Bateman Island, and one mile upstream of Clover Island. The "Cable Bridge" lies another half-mile downstream. Five miles downstream is the mouth of the Snake River, which merges with the Columbia River at RM 325. 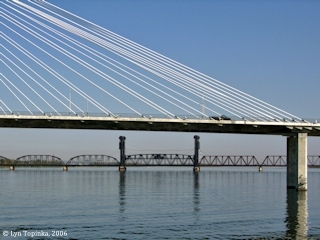 The official name of the Pasco-Kennewick Bridge is the "Pioneer Memorial Bridge", and locally known as the "Blue Bridge". 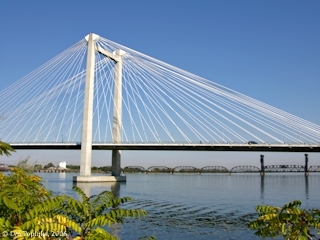 The bridge was built with funds provided by the 1951 Washington State Legislature, and connects the city of Pasco, Washington (Franklin County), with the city of Kennewick, Washington(Benton County). In 2002 the bridge was added to the National Register of Historic Places (Structure #02000241) for its architecture and engineering significance. The bridge also known as "Bridge Number 395/40". 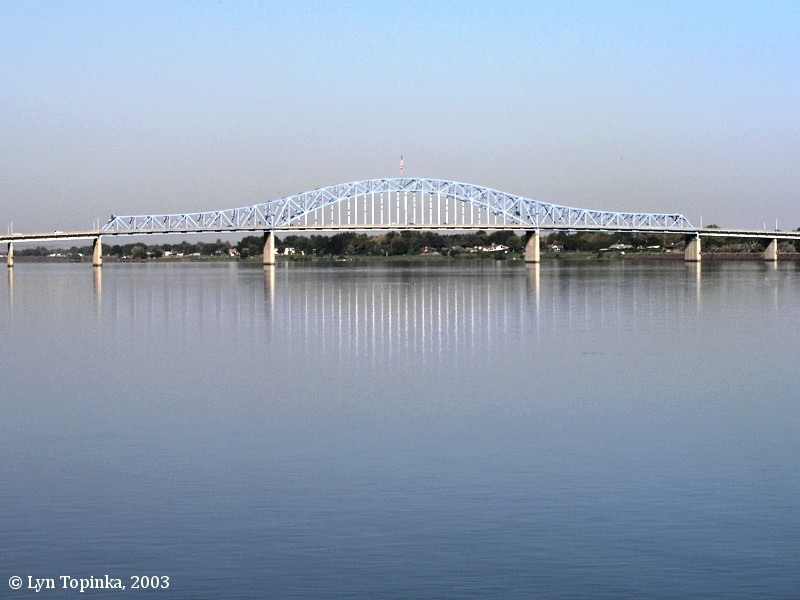 Click image to enlarge "Blue Bridge" from Columbia Park, Richland, Washington. Image taken September 24, 2005. The Pasco-Kennewick "Cable Bridge" spans the Columbia River between Pasco and Kennewick at Columbia River Mile (RM) 328.5. The bridge opened in September 1978 as a replacement for an existing "Intercity Bridge" which was built in 1922. Upstream of the bridge is Clover Island and the Pasco-Kennewick "Blue" Bridge. Downstream is an old railroad bridge, still in use. Three miles downstream is Washington's Sacajawea State Park which offers a view of both bridges. The "Cable Bridge" is officially known as the Ed Hendler Memorial Bridge, named after a former mayor of Pasco, who helped promote the construction of the bridge. Click image to enlarge Pasco-Kennewick "Cable Bridge" from Clover Island. Image taken September 29, 2006. Clover Island lies along the southern shore of the Columbia River at River Mile (RM) 329, and lies between the "Blue Bridge" and the "Cable Bridge". This island is approximately 1/2 mile long. Captain Clark passed by Clover Island on October 17, 1805, as he explored the Columbia River upstream from the mouth of the Snake River. He reached Bateman Island before turning around and heading back to camp, the location of today's Sacajawea State Park. Click image to enlarge Clover Island Inn and "Cable Bridge", Clover Island. Image taken September 29, 2006. 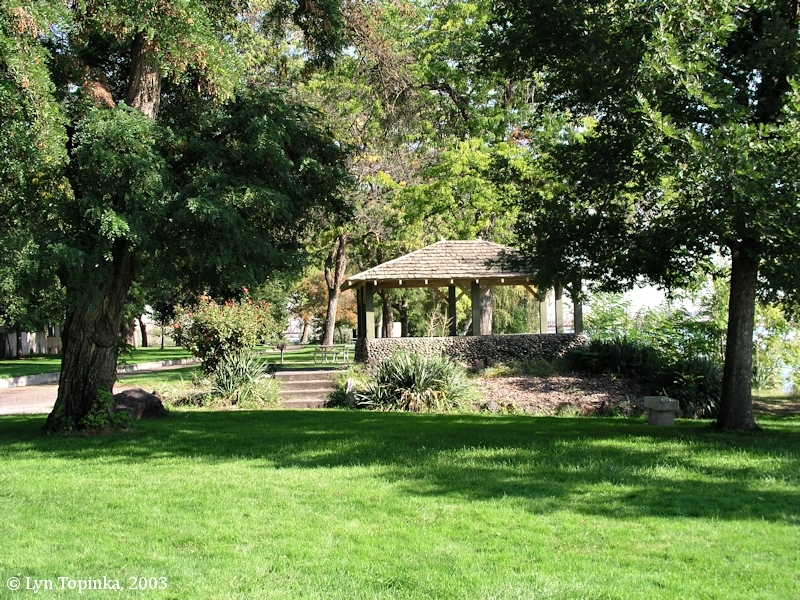 Columbia Park is located on the right bank (south) of the Columbia River (Lake Wallula) between River Miles (RM) 330 and 335. The park covers nearly 606 acres and is located off Highway 240 between Richland and Kennewick, Washington. The park offers excellent views of the Pasco-Kennewick "Blue Bridge". At the park's upstream end is located Bateman Island, the farthest up the Columbia that Lewis and Clark explored. "Kennewick Man", a 9,200 year old skeleton, was unearthed in Columbia Park. Click image to enlarge Dog show at Columbia Park, Richland, Washington. 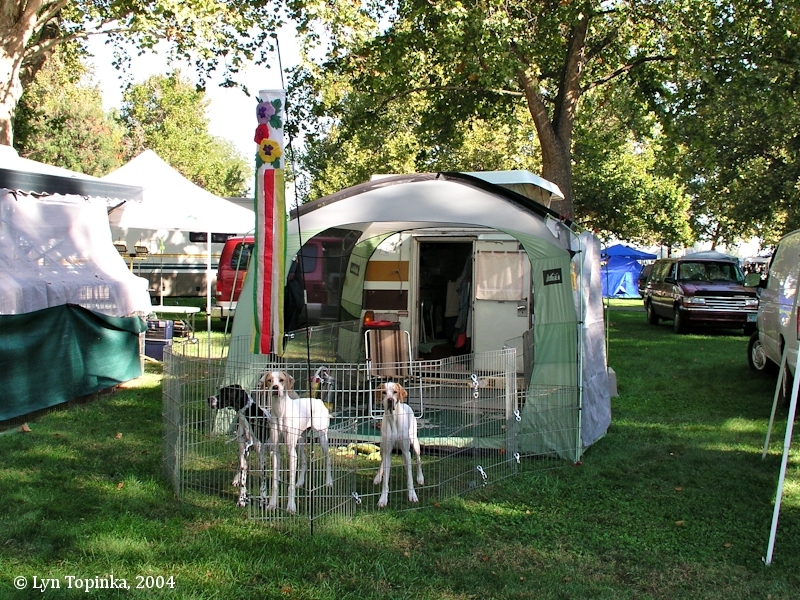 "Little Chinook" set up at the annual Richland Kennel Club dog show, with my "Corps of Discovery" members Lissa, Keeley, and Genna. The show is hosted by the Richland Kennel Club and Columbia Basin Dog Training Club. Image taken September 26, 2004. "On July 28, 1996, the bones known as Kennewick Man were found in the shallows of the Columbia River near Columbia Park, Washington. The U.S. Government seized the bones and ruled that the remains were Native American because they predate 1492. The Government ordered the remains turned over to the Umatilla, Yakama, Colville, Wanapum, and Nez Perce tribes in Eastern Washington. Eight anthropologists, including two from the Smithsonian Institution, filed suit to examine the remains. Preliminary forensic examination suggested an individual different from the typical pre-historic Native American. The bone fragments were taken to the Burke Museum at the University of Washington on October 29, 1998, where scientists examined them. The remains were determined to be 9,000 years old, but DNA testing was inconclusive as to their ethnic origin. On September 25, 2000, Secretary of the Interior Bruce Babbit decided that the remains of Kennewick Man are "culturally affiliated" with Native Americans and ordered them turned over to five tribes in eastern Washington. On October 25, 2000, a Federal judge in Portland questioned the Government's conclusion and scheduled arguments as to the nature of the remains. In June 2001, Kennewick Man reposes at the Burke Museum in Seattle." Source: Washington HistoryLink website, 2004. By 1883 the Northern Pacific Railroad had completed a transcontinental line from Minnesota to Eastern Washington. They needed to cross the Columbia River and the spot they chose was near the mouth of the Snake River, today the location of Pasco and Kennewick, Washington. The line would then follow the Yakima Valley and cross the Cascades at Stampede Pass. A temporary bridge was first built, which opened to trains on December 3, 1887. The permanent bridge was completed on July 14, 1888 and opened soon afterwards. A much-improved bridge remains in use today. 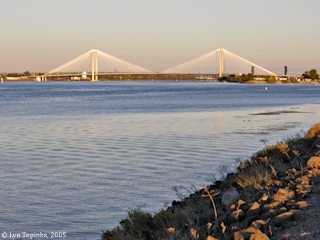 Click image to enlarge Kennewick's Cable Bridge, as seen from Sacajawea State Park. In the foreground is an old railroad bridge, still in use. Image taken September 25, 2005. Click image to enlarge Pasco-Kennewick Northern Pacific Railroad Bridge, as seen from Clover Island. Image taken September 29, 2006. Sacajawea State Park is a 284-acre marine, day-use park located in Pasco, Washington, at Columbia River Mile (RM) 325, where the Snake River merges with the Columbia. Eight miles upstream lie Bateman Island - the furthest upstream the expedition explored - and the mouth of the Yakima River. Ten miles downstream lie Wallula, Washington, and the mouth of the Walla Walla River. On the right bank of the Columbia, directly across from Sacajawea State Park is Two Rivers County Park, which has and excellent view looking back towards the State Park. Behind Two Rivers County Park rises the Horse Heaven Hills. Sacajawea State Park is located on a plain of the great Lake Missoula floods which swept through the area 12,000 years ago. 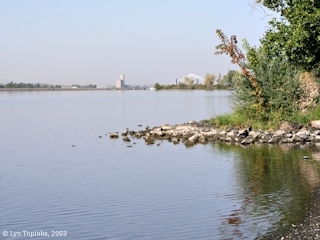 It features 9,100 feet of freshwater shoreline with the park's lands being sand dunes interspersed with wetland ponds. The property was deeded to Washington State Parks in 1931, and was named for Sacajawea, a Shoshoni Indian woman who traveled with the Lewis and Clark expedition. Lewis and Clark spent two nights here in October 1805. Click image to enlarge Sacajawea State Park, Washington. Image taken September 29, 2003. 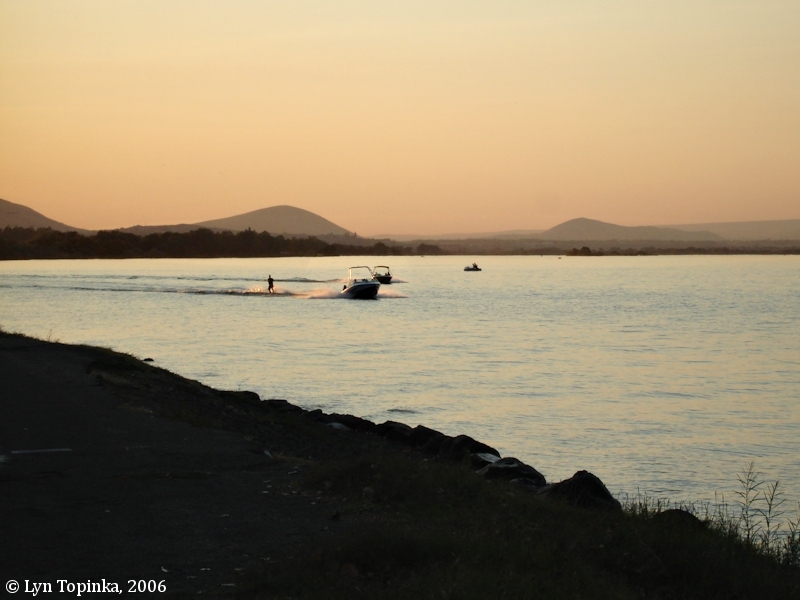 "Two miles below Richland is a good cable ferry across the Columbia, which connects with a concrete road leading to Pasco. At Kennewick is another ferry across to Pasco. From Kennewick to Finley, seven miles, the road was graveled last Summer under permanent highway funds, and from a point on this road a new ferry license has been granted for the crossing of the Columbia into Walla Walla County, about one mile below the mouth of the Snake River." Source: "Morning Oregonian", February 28, 1916, courtesy Historic Oregon Newspapers Archives, Univeristy of Oregon Libraries, 2016. "The Overland made the run from Portland to Spokane in two and a half days. From The Dalles Mr. Holbrook ferried across to Grand Dalles on the Washington side and followed the regular road to Goldendale. Between Richland and Pasco the Columbia River was again passed via the Zimmerman's ferry. ..."
Source: "Sunday Oregonian", July 22, 1917, courtesy Historic Oregon Newspapers Archives, Univeristy of Oregon Libraries, 2016. 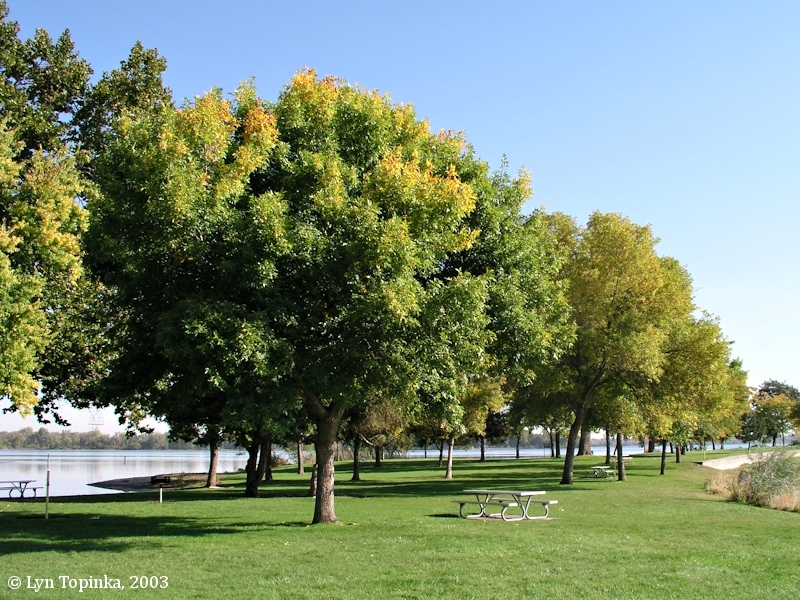 The 273-acre Two Rivers County Park is located on the right bank of the Columbia River at River Mile (RM) 325, just southeast of Kennewick, Washington. 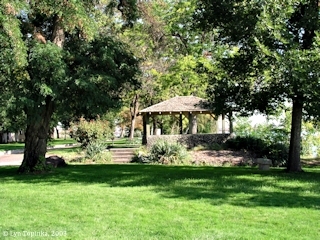 The Park is maintained by Benton County under a lease from the U.S. Corps of Engineers. 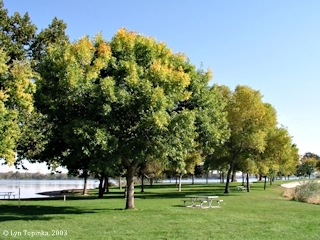 Click image to enlarge Two Rivers County Park, Kennewick, Washington. Two Rivers County Park is across the Columbia River from where the Snake River joins the Columbia River. Image taken September 29, 2003. The Yakima River enters the Columbia River at Columbia River Mile (RM) 333, just upstream of Bateman Island. To the north is Richland, Washington, and to the south are the cities of Pasco and Kennewick. On October 17, 1805, Captain Clark explored the Columbia as far upstream as Bateman Island, just missing the mouth of the Yakima River, before turning around and returning to the junction of the Snake River with the Columbia, the location of today's Sacajawea State Park. 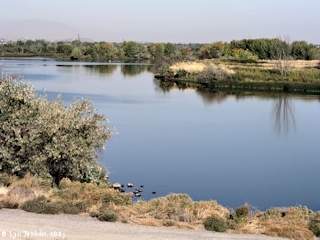 Click image to enlarge Looking towards the mouth of the Yakima River, Washington. View from the right bank of the Columbia River looking back at the "estuary" of the mouth of the Yakima River. Image taken September 26, 2004. The early 1900s was the "Golden Age of Postcards", with the "Penny Postcard" being a popular way to send greetings to family and friends. Today the Penny Postcard has become a snapshot of history. Click image to enlarge Penny Postcard: Lewis Street looking west, Pasco, Washington, ca.1909. Penny Postcard, Copyrighted 1909, "Lewis St. Looking West, Pasco, Wash.". Image copyrighted 1909 by O.C. Towne's. Published by The Towne's Studio. In the private collection of Lyn Topinka. Click image to enlarge Penny Postcard: Docks, Pasco, Washington, ca.1910. Penny Postcard, ca.1910, "Pasco Docks, Pasco, Wash.". Divided back. In the private collection of Lyn Topinka.